Work will shortly commence on the redevelopment of a former car dealership and pub on Bexhill road St Leonards on Sea. The scheme will comprise three units, two have been pre-let to Aldi and Greggs with 2,400 sqft remaining. The total floor area of the scheme is 22,100 sqft. 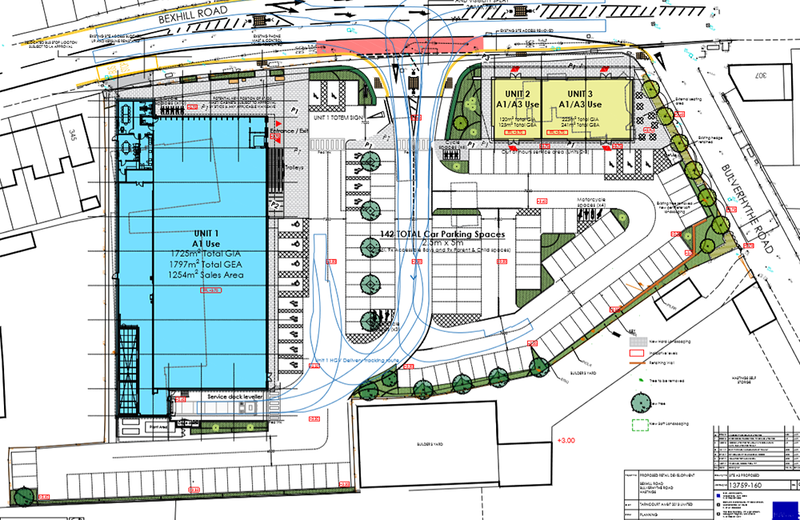 The layout plan shows the three units, car parking and new access/egress arrangements via Bexhill Road. The site is prominently situated on Bexhill Road (A259) between Hastings town centre and Bexhill Retail Park which accommodates most of the major brands. Topps Tiles are diagonally opposite and Carpetright/TK Maxx close by.